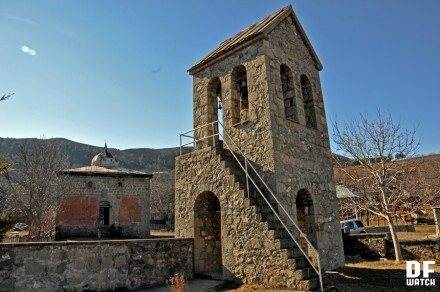 ADIGENI, DFWatch–Two mosques in the south of Georgia were Monday granted cultural heritage status. 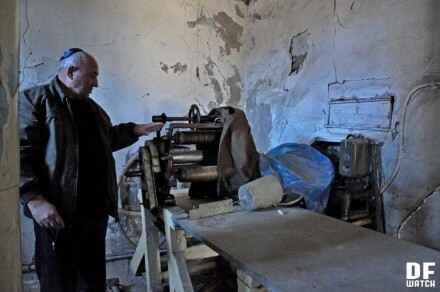 We went to the Samtskhe-Javakheti region to see how religious minorities are living there. One of the mosques designated as cultural heritage lies in the middle of the village Adigeni. Constructed in 1885-1886, today it lacks a roof and the walls are collapsing. Locals claim stones are coming off the walls. Another problem is that some locals are against restoring the mosque. There hasn’t a been major religious conflict, but part of the population have collected signatures in support of erecting a church in the place where the mosque stands. That initiative failed. 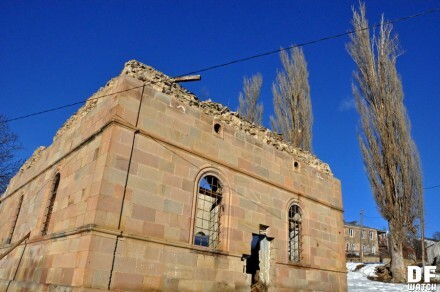 Murman Pailodze, one of the locals, says that it is possible to turn the building into a church, but they were denied permission to do it. We met a sixth grade girl from Adigeni, who was out walking with her horse. She told us that Muslims come here from time to time to visit the mosque. She remembers how adults fought to construct a church there instead, but they were unsuccessful. Now she goes to the church in the nearby village, where his brother serves and another brother is in a choir. The other mosque which was designated given cultural heritage status is in the village Plate, in Adigeni municipality. 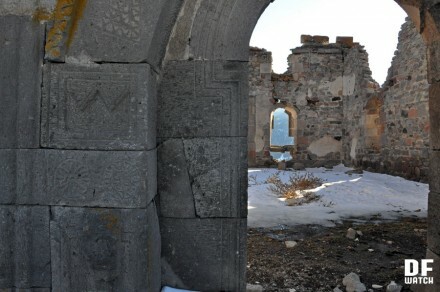 It was constructed in 1927 by Meskhetians, or Meskhetian Turks, who were resettled in Soviet times. It is also roofless. In both of those cases, locals are not against restoring the building, but they do not want the mosques to be in use. 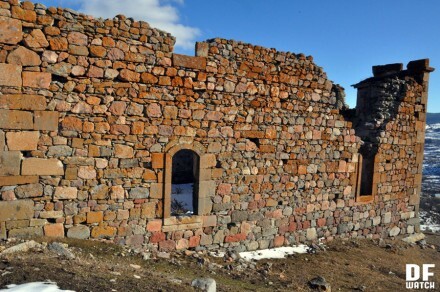 The NGO Human Rights Center, which works on this issue, says a priest at Zarzma monastery in Samtskhe-Javakheti, Nikoloz Getsadze, took stones from Plate Mosque and brought them to the monastery to use for construction purposes. The organization asked the Prosecutor General’s Office to investigate the case, but there never was an investigation. Getsadze is often spotted in places where there is religious conflict in this region, notably a years ago in the village Chela. In the village Sakuneti, a mosque which was built in 1927 stands next to an Orthodox church. 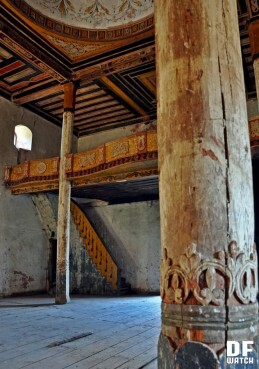 Both structures are designated as cultural heritage. The church is in operation, but the mosque is closed. 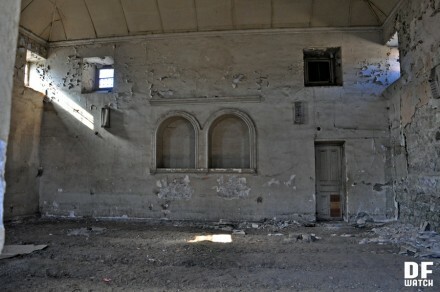 Even though it received heritage status in 2012, it remains in a derelict and dangerous condition. A woman who lives next to the mosque used to take care of it, cleaning it, but when the media reported this, she came into conflict with her neighbors and gave up. She didn’t wish to talk with us, saying she doesn’t talk to journalists. In Akhaltsikhe, which is the central town in Samtskhe-Javakheti, there are two synagogues next to each other on Guramishvili Street. One of them was built in 1863 and has cultural heritage status. 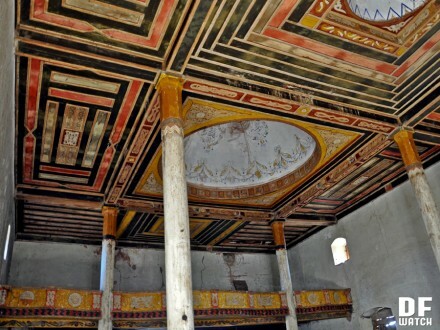 It is well preserved and was refurbished in 2012, when Rabati Castle was reconstructed. 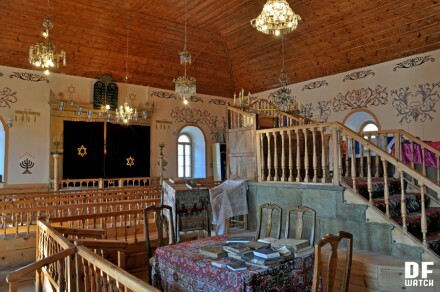 It is the oldest synagogue in Georgia. Not many people come here to pray, and it is therefore only operational in summer. Simon Revishvili, head of the Jewish community, says tourists come to visit every day during summer. Another synagogue, a few meters away from the first one, was built in 1927. 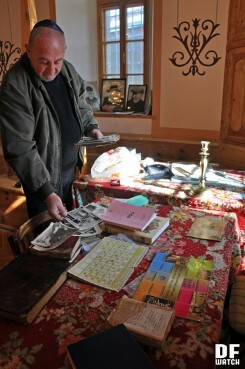 There used to be a library, a cinema club and other facilities during the Soviet Union, even a boxing gym. It is abandoned. Shorena Kokoshvili has settled in a room on the second floor of the abandoned synagogue with her daughter and granddaughter. She says she takes care of the synagogue, but she cannot protect it from vandals all the time. The government offered her a house in another village, but she said it was not the best option for her, as she earns her money by cleaning houses next to the synagogue. She won’t be able to sustain her family in an unknown village, she tells us.